To accomplish what our country calls us to perform. George Bush was born on July 30, 1839, in Minden, NY, the second of nine sons of Jacob Bush (recently changed from Quackenbush) of Root, New York, and Sarah Blodget Root of Strafford, Vermont. In 1841 he moved with his family to Bernardston, Massachusetts where they remained for nine years. In 1850 the family moved to Brookline, Windsor County, Vermont and bought a house on Putney Hill. His grandparents, William Brisco Root and Edith Allen, were residents of Brookline and the family most likely moved to be closer to them. Although we don't know much about his childhood, he was educated in the Round School House in Brookline and probably helped his father with the farm and apple orchards. On November 27, 1860, George married Helen Ordway in Brownington, Vermont. On September 3, 1862, George enlisted in Co. I, 15th Vermont Regiment. At the time of his enlistment, he was 23 years old, 5 ft 5 inches tall, with a light complexion, blue eyes, and brown hair. 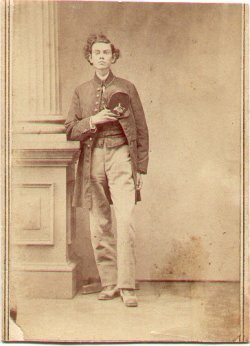 He was promoted to Corporal on January 1, 1863. George served with the 15th Regiment in Washington, D.C., Virginia, Maryland and finally in New York City during the draft riots. He was mustered out with the entire Regiment on August 5, 1863. George returned home and during the next year, he lost his 2-year-old daughter Ada and his 3-month-old daughter Gertrude who was born after his discharge from the 15th Regiment. A month after their death, on September 20, 1864, George once again joined the Union Army, this time with Co. H, 1st Maine Regiment of Heavy Artillery. With that organization, George helped man the heavy artillery fortifications outside Washington, DC. He was discharged on September 25, 1865. After the war, George lived in Mexico, Missouri for a year, Barton Landing, Vermont for 25 years, Burlington, for 5 years, St. Johnsbury, for 2 years, and Manchester, New Hampshire for 10 years. He was a mechanic. At the time he requested his Civil War pension he was a resident of Somerville, Massachusetts. George owned property in Barton Landing, which he sold in 1893 and 1894. 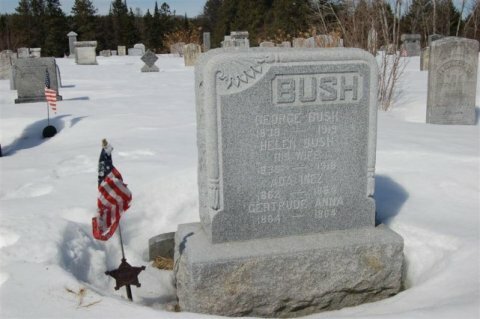 George Bush died on March 16, 1919, in Somerville, Mass., and is buried in Brownington Center, VT with his wife Helen Ordway who preceded him in death by one year, and by their two infant children who died in 1864. Gary D. Cooper, San Diego, CA July 7, 1998. I received your letter this morning and was glad to hear from you. I wrote when I sent the money to you that I wanted you to send me my box right off post haste. The quicker the better for I am waiting for my boots and shirts. If it does not come pretty soon I shall buy some boots and some shirts if I can get some more money. I cannot write any more until I get some stamps from you. I have sent 5 or 6 times but get none yet. I have not heard from you since I last saw you at the departing at Barton. And only a few days ago did mother let me know where you were. I sent one letter to you a month ago but directed it to the 7th Vermont Regiment so you have not received it I guess. We are doing guard duty here now. That is one Battalion of this Regiment, the 1st Maine Heavy Artillery. I hear you are near here but where do not know, but suppose upon the Appomattox under Gen. Butler. I was in the fight on the left the 27th. Got hit a little in the back by a Minnie ball. The Johnnies had a cross fire on us when we were forming to charge. They did not hurt me much but the ball passed through all my clothes and drew blood a little, not much. Have you seen any battles yet? If not, I wish it might be that you need not, but someone must fight to save our country. This is the issue. If they are conquered all is well with our great government, and they must be. We must use our muskets in good earnest, not serve our time as safely as we can to ourselves to go home to enjoy our bounty. But fight like earnest Union men. Like men who are determined to accomplish the object that our country calls us to perform. May God shield each of us from the dangers of this strife and allow us to go to our homes and kindred in health and peace when our term of service is over. I enlisted September 20th and so you see I have been in service two months. Am in for three years. Now please tell me the cause of your silence, will you? Did you think that I ought to write first? You might have written to Helen. I received a letter from her last night. Her health has been very poor. The loss of our little ones so suddenly then my enlisting without her knowledge was too much for her weak nerves. It has almost ruined her happiness for the present certainly. My health is fair, not as good as usual but for duty all the time. Was on guard last night in the rain. Go on every other day now. There is some 60 or 80 niggers that work at the station most all the time so you can guess how much supplies are handled here. It is 4 miles to City Point. We expect another move as soon as the roads and weather permit but where we know not. Cy has gone to keeping house in the north end of his father's house. I suppose they are as happy as two can be at present. How I wish I could see you. I could get along better than this way. Write soon, and a good long letter, wont you. Address me at the Co. H, 1st Maine Heavy Artillery, Washington, D.C. We are the 1st Regt, 1st Brigade, 3rd Division, 2nd Army Corps. Our badge is red diamond. Now good bye. Take good care of your health. Write often and oblige your affectionate brother. I am well, am not going home with the regiment. Will be transferred to some other regiment. Was not on review or on picket. Weather very rainy and cold, has been for two days and look for more yet. Helen is at Chelsea, Vermont but all letters go to North Bunbridge at this time. She is very anxious for me to get home and will be very much disappointed when she finds I must stay a while yet. Hope you will get home soon. Our folks are very glad that we are yet well and so are we. Give my love to all the boys and tell them that the march to this place was first rate. Hope to meet you in old Vermont the next time unless you should pass through this place when you go home. If so, let me know will you? I have no news. All three of George's letters that we have were written to his younger brother Lorenzo. The last two were written when Lorenzo was in the war as a member of Co. B, 9th Vermont Regiment. Lorenzo apparently sent the letters home, thus preserving them. Contributers: letters and older photograph of George Bush are from the collection of Brad and Dot Bush, Brookline, VT; younger photograph of George Bush Contributed by George Kane, Chicopee, MA; biographical data on George provided by his great-granddaughter, Kathryn Goddard Bush Meyer of Wichita, KS and Gary Cooper of San Diego, CA.